Copter supports Return-To-Launch in cases where contact between the Pilot’s RC transmitter and the flight controller’s receiver is lost. This page explains this failsafe’s setup and testing. Note the “Radio failsafe” was previously called “Throttle failsafe” because of the way in which some receivers use the throttle channel to signal the loss of contact. Copter also supports Battery, Ground Station and EKF/DCM failsafes. The wires connecting the receiver to the flight controller are broken (unlikely). Note: with APM2 only the ch3 connection between receiver and flight controller will trigger the failsafe. Continue with the mission if the vehicle is in AUTO mode and the FS_THR_ENABLE parameter is set to “Enabled Continue with Mission in Auto Mode”. If the failsafe clears (i.e. transmitter and receiver regain contact) the copter will remain in its current flight mode. It will not automatically return to the flight mode that was active before the failsafe was triggered. This means that if, for example, the vehicle was in Loiter when the failsafe occurred and the flight mode was automatically changed to RTL, even after the transmitter and receiver regained contact, the vehicle would remain in RTL. If the pilot wished to re-take control in Loiter he/she would need to change your flight mode switch to another position and then back to Loiter. “Low-Throttle” method - the receiver pulls the throttle channel (normally channel 3) to a value below the bottom of it’s normal range (normally below 975). This method is used by Futaba systems and many older systems. “No Signal” method - the receiver stops sending signals to the flight controller. This is the preferred method and is how most modern FrSky receivers operate. Each brand of Transmitter/Receiver is slightly different so please refer to your transmitter’s user manual to determine which method is available and how to set it up. Above is the setup method for a Futaba T7C Transmitter with R617FS or TFR4-B receiver which uses the “low throttle” method. 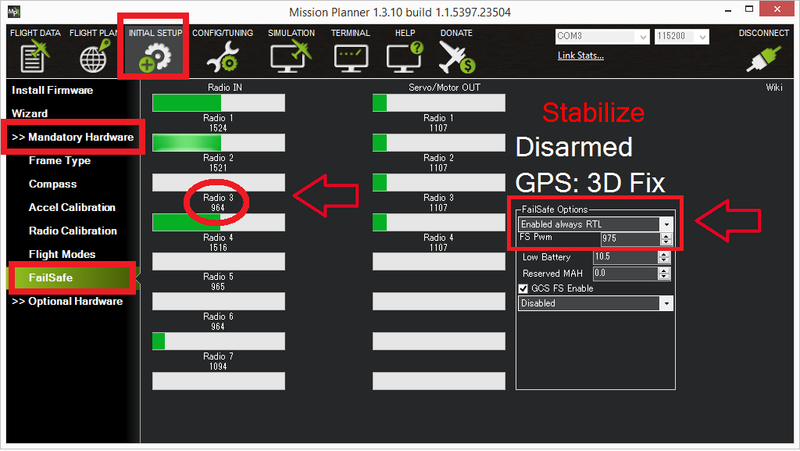 Connect your flight controller to the mission planner and select Initial Setup >> Mandatory Hardware >> Failsafe. “Enabled Continue with Mission in AUTO” to allow the vehicle to continue with missions even if it takes the vehicle outside of RC range (not recommended). In all other cases the vehicle will RTL. Above is the setup method for a FlySky 9 channel transmitter with FrSky D4R-II receiver which uses the “No Signal” method. Because the throttle is not pulled low, there is normally no need to adjust the “FS Pwm” value from it’s default (975). Just ensure that it’s well below (i.e. at least 10pwm points below) the minimum value that channel 3 (throttle) can be. 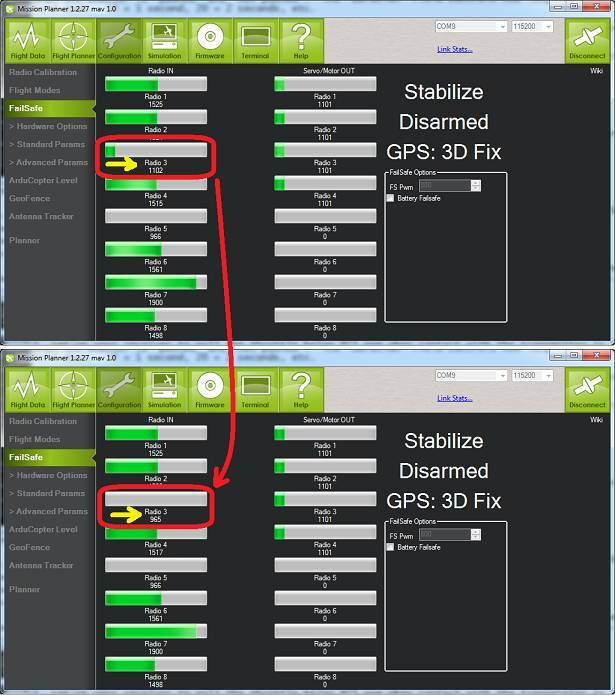 You can check your failsafe by performing the following tests with the Pixhawk/APM connected to the Mission Planner either via a USB cable or telemetry link. You can complete these tests without plugging in your LiPo battery but if you do connect a battery you should first remove the propellers. Switch to stabilize mode, arm your motors but keep your throttle at zero. Turn off your transmitter. The motors should disarm immediately (red led will start flashing, DISARMED will be displayed in the Mission Planner’s Flight Data screen). Switch to stabilize mode, arm your motors and raise your throttle to the mid point. Turn off your transmitter. The Flight Mode should switch to RTL if you have a GPS lock or LAND if you do not have a GPS lock (the flight mode and GPS lock status are visible in the Mission Planner’s flight data screen). while the flight mode is still in RTL or LAND and armed, change the flight mode switch to another position and then back to stabilize mode. Ensure that the flight mode displayed on the Failsafe page is updating appropriately. Switch to stabilize mode, arm your motors and keep your throttle above zero. Instead of setting up the receiver and flight controller as described above (i.e. “Low-Throttle” and “No Signal” methods) the receiver can be set-up to set channel 5 (flight mode channel) to a flight modeslot that has been set to RTL. For example the receiver could be setup to move ch5’s pwm value to 1700 which is “Flight Mode 5” which could then be set to RTL on the Mission Planner’s Initial Setup >> Mandatory Hardware >> Flight Modes screen. Although this mostly works it is not recommended because it will not trigger if the receiver loses power or if the wires between the receiver and flight controller are broken.